Yesterday, we had the opportunity to experience first hand a sample of what the Mind Museum has to offer for families and kids. Having raised PHP 512 million from individuals and organizations, this first ever world-class science museum in the Philippines targets to open in the latter part of 2011 and is to be located in Taguig City. 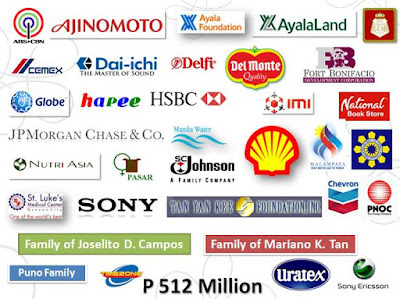 By helping build The Mind Museum, we help build imaginative minds -- we help inspire future scientists, engineers, doctors, etc., that would help build our country. (Research shows that a country's progress in science and technology is directly correlated to economic progress). A feature of the Mind Museum, the Roving Space Shell, sponsored by JP Morgan Chase and Company, is currently being hosted at the Activity Center in Market! Market! in Bonifacio Global City, from May 29 to June 5, 2010. 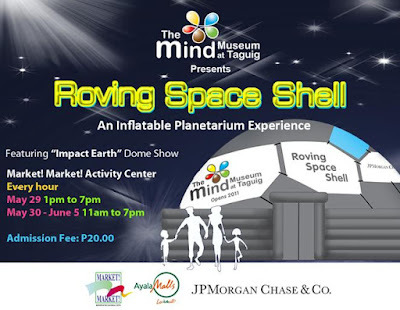 This inflatable planetarium can be experienced by all for a minimum individual cost of PHP 20. Shows run hourly from 11am to 7pm. 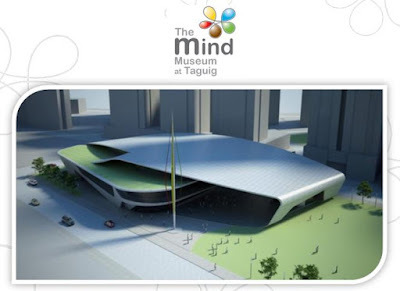 If you would like to sponsor a star (PHP 1,000) or a constellation (PHP 5,000) and become a part of this educational endeavor, visit the official web site of The Mind Museum at www.themindmuseum.org.